Skateboard P makes sure the chair color matches his Ferrarri key… As if being one of the world’s foremost music producers, trendsetting fashionistas, streetwear entrepreneurs, ladykillers, and Louis Vuitton designers wasn’t enough, the starmaking PHARRELL “SKATEBOARD P” WILLIAMS has now added high-end modern furniture design to his extensive resume with the official debut of his “Perspective” chairs at GALERIE EMMANUEL PERROTIN in Paris this week. 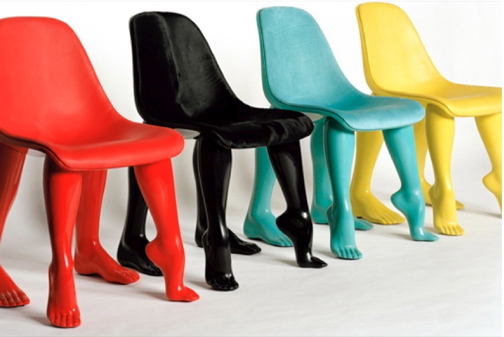 A seat supported with the legs of both a man and a woman, the “Perspective” chair was created to resemble a street-level view of a couple in the midst of getting it on, is rendered in slick acrylic, and available in four colors with the choice of leather, incredibly un-PC veal skin, or velour leather for the seating material. Priced well out of reach of Pharrell’s loyal legion of young streetwear zombies (the chairs cost a wee bit more than the most expensive pair of Bapes), these pricey walkers are sure to be the furniture of choice for a new wave of rap videos to come.